Regatta's iconic Isolite waterproof and breathable packable jacket could also be named ‘Life Saver’ for the amount of times it's saved people from a soaking. As the name suggests, this waterproof jacket packs away into a small bag, is lightweight and easy to carry, but when it comes to rain this durable rainshell will keep you dry in the worst of conditions. The features of the Pack Away include a waterproof and breathable Isolite 5000 lightweight polyamide fabric; taped seams; integral hood; studded stormflap with hook and loop; 2 lower pockets; mesh stuff sack. 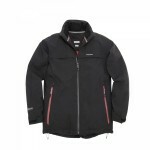 Regatta Packaway II Waterproof Jacket.